Okay, so before we get to that exciting title, I’ll try to put you out of your misery on the wood (and “wood”) samples that I teased you with last week. I showed you these three options and hinted (okay, flat out told you) that only one of them was wood. It’s the one on the right. Which…was my favorite (BUT I totally forgot to write down the name…sorry). But it’s also over twice the price of the other two, not to mention about half as practical. 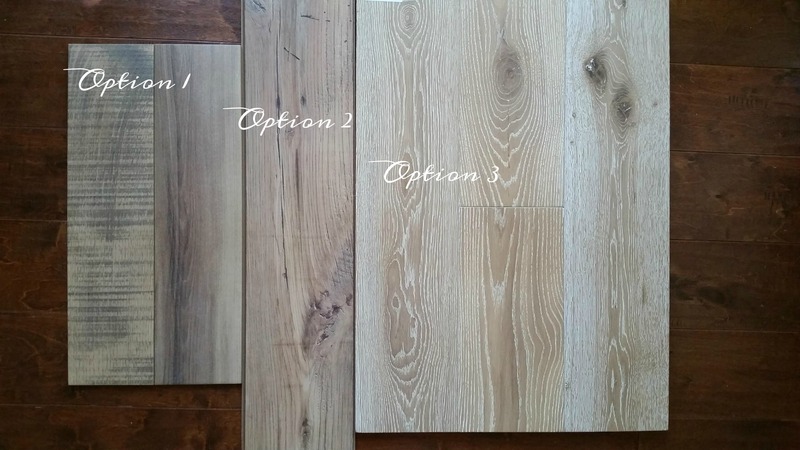 It’s actually engineered hardwood (which means only the top layer is real wood), and we considered laying it in part of the downstairs, but ultimately, as much as I love the white-washed plank look, I think I’m better off going with something super durable in the kitchen and dining. At this point, we’re seriously considering going with this combo instead. That would be Option 1 (on the top), which is a Shaw porcelain tile product called Napa Noce in Cask, in the kitchen/dining and Option 2 (on bottom…y’alls fave by far) in the rest of the house (minus the bathrooms). It’s actually a laminate wood product by Mohawk (Rare Vintage Fawn Chestnut), which is supposed to be super-durable (but still is not ideal for kitchens since you can’t wet-mop it, and, boy howdy, do we put the wet in wet-mopping round here. “Flood mopping” might be a more apropos term for what the boys do). It’s hard to see from this picture with the harsh fluorescent lighting and angle how closely the two tones match, but they really do. 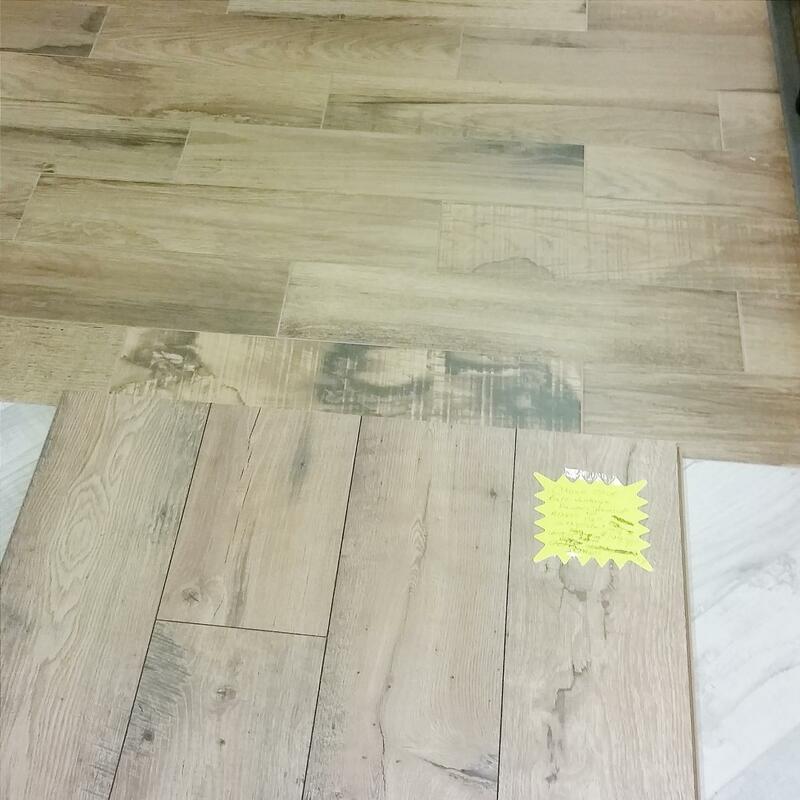 They’re a different width, but there’s a cased opening between the kitchen and the living room, so our plan is to run a plank under the opening to create a divide between the two “woods” and then have porcelain on one side and laminate on the other. (Contrary to what the picture suggests, they will be running the same direction, not perpendicularly). Even the owner of the lumberyard was impressed with how closely the styles and tones matched in person. Also…remember how I mentioned how consistent I am once I like something (i.e. picking the same paint color we were already considering from across the room at Lowe’s)? Well, I went to a different store the other day juuuuust to see if they had something I liked better at a comparable price and picked out a “similar” look…which…when the sales rep actually looked up the name, ended up being the Fawn Chestnut AGAIN! Just change my middle name to consistent and/or obsessed. So! That’s the current plan. It could change. But I think, no matter what we finally end up with, I’ll probably go with a wood-look tile in the kitchen, since it gives me the style I want with the price/durability our big, mess-making family needs. (Unless, of course, some of you have laminate in your kitchens and have had a great experience with it, in which case…CONVINCE ME!). Oooooookay! So, that was pretty much a blog post all its own, but I couldn’t let the week completely get away without blogging a belated Happy Birthday to the twinsies. 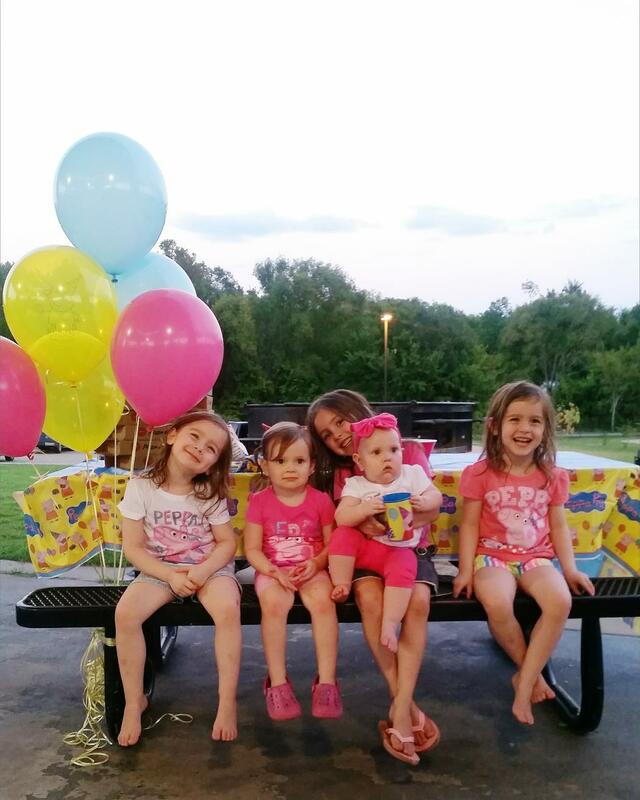 They turned 4 on Saturday, and it’s still a bit surreal to think that it was that long ago that this happened. Of course, they are tiny no longer. I’ve admitted here several times before the unique challenges that I’ve encountered with mothering twins–especially after they hit age 2 1/2 (up to which point they were actually considerably easier than I expected). It’s been a constant process of adjusting and tweaking and finding new ways of implementing old tricks. Oh, and prayer. Lots and lots of prayer. On the one hand, they are some of the most joyful little creatures you’ll ever meet. Smiling and jumping and squealing with laughter. They’re suuuuper snuggly and thrive on attention and loving touch. But all of that touchy-feely emotion definitely has its downsides, and we’ve muddled through a good 18 months of meltdowns and tantrums the likes of which I would love to say my kids never do, but–um–apparently they do. It’s been getting steadily better for the last six months or so, but we’re still privy to an impressive display of fireworks every so often (or 4 days in a row, depending on how rested they feel). Still, I know that the experience of parenting two very sensitive, very quintessentially female little humans ((who are very different from their mama in this respect) has been so, so good for me. And seeing their characters develop–their desire to help and nurture and mother (Evy) and encourage, cheer-lead, and comfort (Nola)–has been such a testimony to the Lord’s goodness and faithfulness in my children’s lives. Because motherhood is sanctifying. And hard is not the same thing as bad. (Can I get an amen?). Honestly, I’m excited about year 5 for the twins. I can’t wait to see their personalities blossom and their friendship with each other (and others) deepen. I have great confidence that he who began a good work in them (and me) will carry it out until it is completed. (Philippians 1:6). Now, I just need to find someone to teach one how to play violin and the other one to play cello, and I’ll be all set. 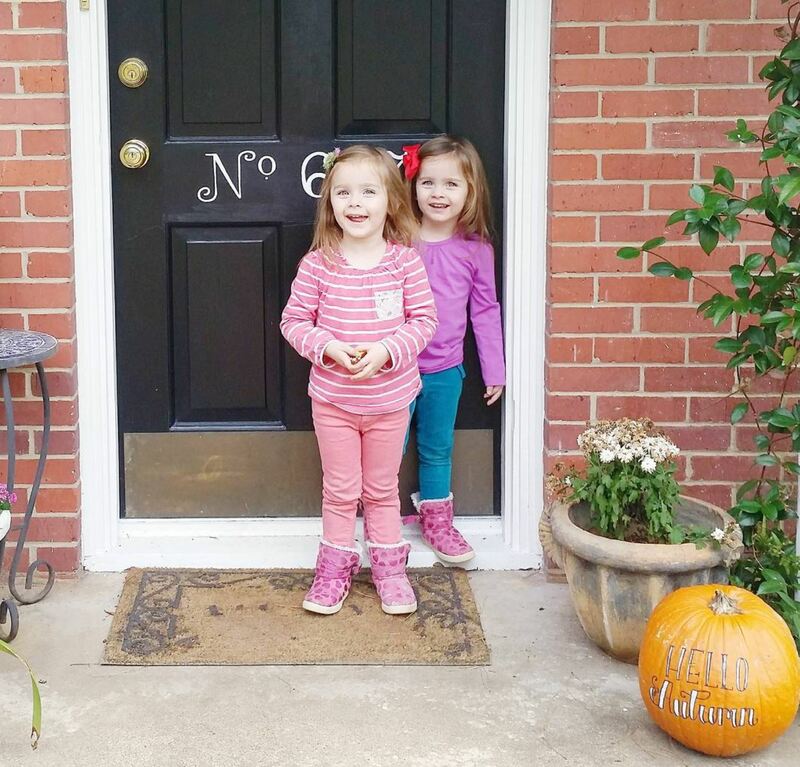 Remember when I talked about how Evy and Nola are finally kind of living up to the “double trouble” hype now that they’re both in full-on threenager mode? We’ve been doing a little better recently (they’re playing together in the guestroom currently with a minimum of squawking), but there were definitely moments in the last 3 weeks or so that tested my resolve not to run screaming for the hills (or the chocolate). Most of those moments involved a fair bit of screaming of their own–in toddler form. Usually while we were all imprisoned in the same car, and the complaint had something to do with the fact that said toddler(s) had asked for a banana, and I had given her one. Remember that Christina Aguilera song: “What a girl wants, what a girl needs, whatever makes you happy sets you free?” (I do, but only because my sad post 6-kids brain keeps the junk and boots out the important stuff like Bible verses and the location of my keys). Well, good ol’ Xtina had no idea she was writing about toddlers. But she was. Except the opposite of that. Because the joy of toddlers is that giving them what they want does NOT make them happy half the time, and doing everything to make them happy all the time only ends up imprisoning them in a cycle of entitlement and discontentment. (Come to think of it, that’s true of just about every age). Toddler tyranny is real, y’all. And I have only to watch my 3-year-olds’ sweet, (seemingly) guileless, cherubic little faces melt into a mask of ugly, purple rage at the word, “No,” to be reminded that sin nature is real, yo. (As if I needed a reminder when I have so many mirrors in my house). So, why the discourse on the seedy underbelly of the toddler temperament? Because I want you to understand that I get it. I feel your toddler-angst. Sometimes way down deep into my toenails (I miiiiiight have possibly referred to one of my children as an “emotional terrorist” after the 5th consecutive day of 20 minute car tantrums that resulted in ringing ears for everyone in a 2 miles radius). It’s how I felt one day when I was out and about with only the twins and Theo, and I ran into the dad at Chick-fil-a whose 2-1/2-year-old twins looked angelic enough with their giant blue eyes, glossy auburn curls, and matching Texas-sized red bows. I cannot emphasize enough how offended I WASN’T, y’all. Please do not read this as a gripe post because nothing could be farther from the truth. This poor guy was clearly overwhelmed, and the thought of more than two was enough to make his eyes bug (or maybe it was the thought of 6…either way). 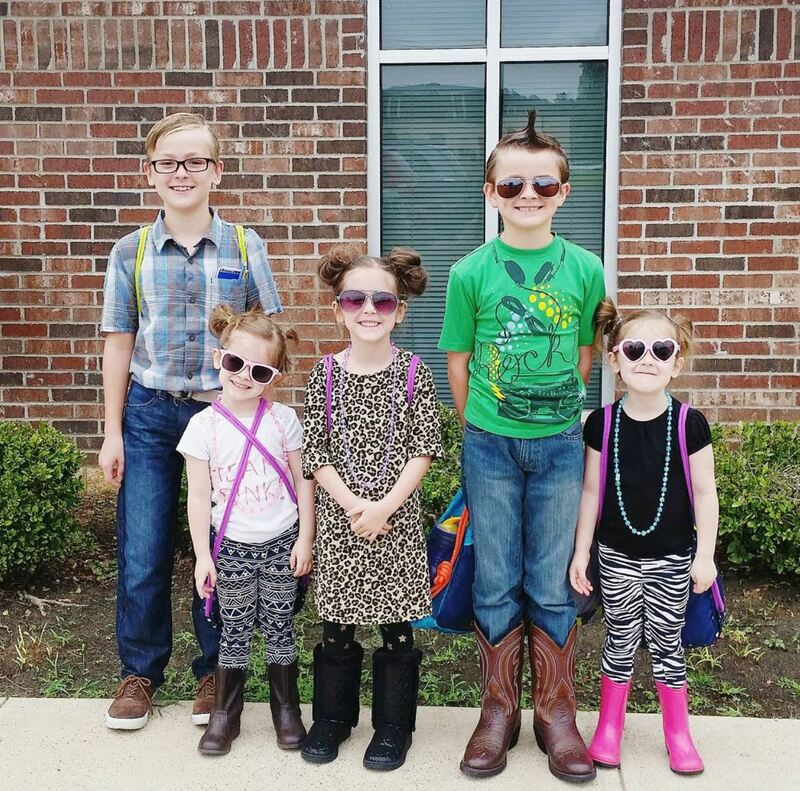 I smiled even wider and said, “You know, though, pretty soon, they’ll be 4, and they can buckle themselves and wipe their own bottoms–because they’re potty-trained, which is awesome. And then they’ll start helping with the dishes and telling you cool stories. And yeah. It’s really fun!” (Yes, I know. It’s not all “fun” at any age, but this guy needed to see some light). I’m not going to lie: while I was still completely UNoffended, that last statement made me sad. And you pretty much have two choices: 1) walk away (whatever that looks like: giving down to the toddler, eating the entire bag of chocolate, losing your temper and yelling just to get the emotional release) or 2) keep chipping away. 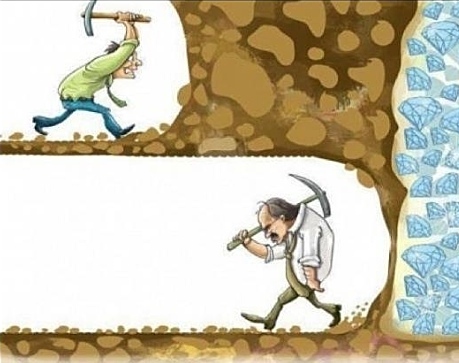 Just keep persevering. Just keep pressing on. Just keep swimming (that Dory, though; quite a philosopher, that one). I’ve done both. I’ve quit too early. And I’ve kept on plugging along. And I’ve always regretted the former and always been so thankful for the Lord’s mercy in the latter. Because I can’t tell you how many times I’ve been absolutely convinced that the discipline is not working, that they’re just not getting it, that they will never EVER choose right on their own, and then–BOOM!–the 7-year-old is crazy-helpful in Walmart and tells you that it’s because he wants to be like Jesus, and your heart just explodes. If that’s not hitting the mother lode, y’all, I don’t know what is. This post has nothing to do with how many children you have, so I hope you don’t get sidetracked by that. Kids can be tough, whether you have 1 or 20. But I do wish I could have had an honest conversation with that man about why he didn’t want any more children. Because, the best I could tell, his entire reasoning was that: kids equal hardship. And I don’t want that. Me too. When Nola is wailing like some sort of malfunctioning smoke alarm, all I want is for her to quit. I’m not particularly interested in learning some sort of deep spiritual lesson. My oven broke last night. And I want it fixed. Period. I am a busy mama who does not have time for broken ovens. But you know what? If the toddler never screamed like a banshee, then I would be infinitely less likely to throw myself on the mercies of Jesus and say, “Help me, Lord! I can’t do this on my own!” (Although it’s no less true when she’s being docile). And if my oven just kept doing its thing, I might never take a moment to be grateful for the magical contraption that usually cooks my food perfectly every time. And to pray for the mamas who don’t have anything like that luxury ever. “…we rejoice in our sufferings, knowing that suffering produces endurance, and endurance produces character, and character produces hope, and hope does not put us to shame, because God’s love has been poured into our hearts through the Holy Spirit who has been given to us. Hope does not put us to shame. I love that! Of course, the truth is that I have no idea what actual suffering looks like. Compared to 95% of the world, my life is a cake walk. But I am so grateful that the Lord takes my piddly little trials and works them for good in my life, patiently chipping away at my selfishness and impatience. And I am so grateful that the Lord sees fit to keep digging through the tunnels of my heart looking for diamonds. I know they’re there because He created me in His image. He is so kind to this child of His. May I follow His example with my own children. P.S. 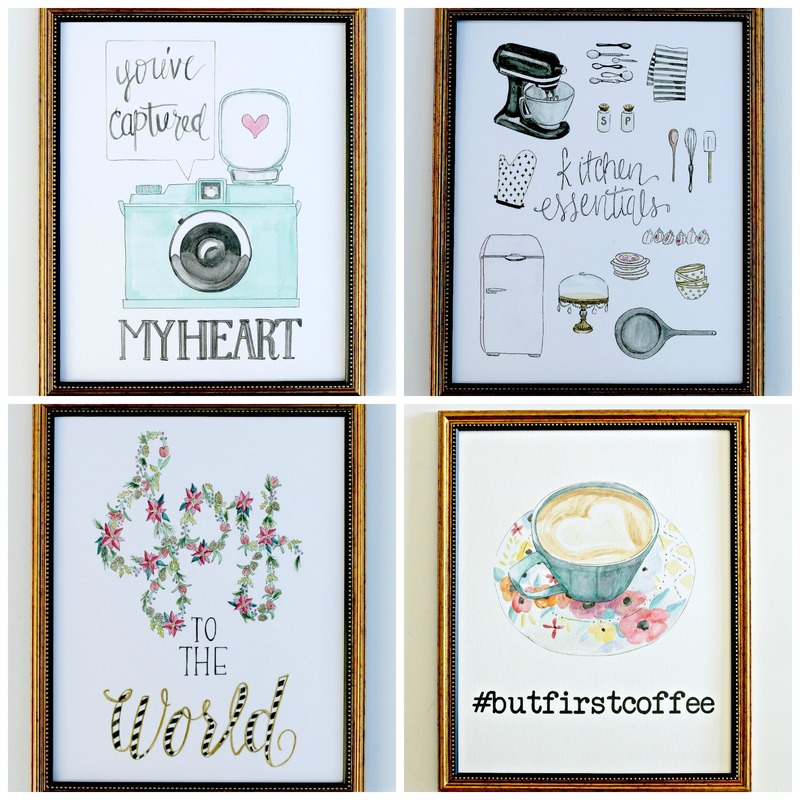 This has nothing to do with this post, but we just made a new print all about COFFEE (hey, tired, overwhelmed mamas need caffeine sometimes to keep mining for those diamonds; maybe it is related to the post). See it there on the bottom right? I don’t even drink coffee, but I love it so much, I’m thinking I may just have to find a place for it in my house. ANY orders placed by the end of today get entered to win a $15 Starbucks gift card + a Cup of Cheer print + other goodies (see more on the Paint and Prose Instagram).